Now we're talking, another review of a Layer Cake Wine. Here we have the 2010 Layer Cake Primitivo (Zinfandel). I can already feel my mouth salivating just thinking about this wine. 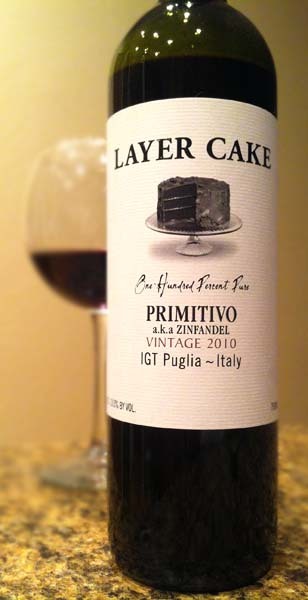 Awhile back, I reviewed the 2008 Layer Cake Primitivo (check out the review here) and loved its dark decadence. So when I got the chance to review the new 2010 vintage, I was excited to say the least. The 2010 Layer Cake Primitivo (aka Zinfandel) pours an inky black with violet colors peeking at the edges. It smells of prunes, blackberries, and more of that Maduro cigar wrapper I found in the 2008 vintage. Tasting brings a bold mouthful of overripe blackberries and plums that transitions into notes of raisins, with some mocha, worn leather, and a fair bit of spice, finally ending on a dry oak note. Bottom line, another awesome wine from Layer Cake. I would gladly pay double the $15 retail price for this one. I dare say this vintage is tastier than the 2008, with loads of dark, ripe fruit upfront that shifts into a nice, earthy dry finish. This is a wine that could easily stand up to some strong, boldly flavored beef or game. Or it could pair up with a dark, oily Maduro wrapped cigar to mirror and accentuate those notes. Either way, it's going to be great. Go check out my other Layer Cake wine reviews HERE. I've almost made my way through all of their varietals and have tasted a couple vintages on a few. None are lacking in flavor, at all. Also, go say "Hi" to the folks at Layer Cake on their Facebook page. Tell 'em I sent ya. Drink This: if you love extremely dark and rich wines. Don't Drink This: if you don't like tasty, deep reds.